NEW YORK -- Two Saudi sisters found dead along the banks of the Hudson River had made statements they would rather kill themselves than return to Saudi Arabia, the New York Police Department said its detectives had learned. But so far, investigators have uncovered no credible evidence that Rotana Farea, 22, and Tala Farea, 16, were victims of foul play, Chief of Detectives Dermot Shea told reporters at a press conference Friday afternoon. Investigators are gaining a clearer picture of two Saudi Arabian sisters' final weeks before they were found dead on the banks of the Hudson River. 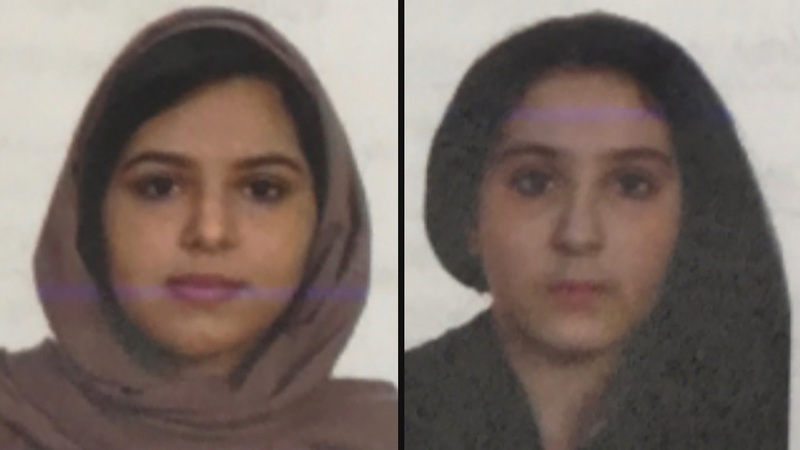 According to credit card records reviewed by the New York Police Department, the Farea sisters arrived in New York from Philadelphia two months ago after visiting Washington. More than a week after their bodies were discovered, investigators have so far provided few answers as to how the sisters -- last seen together August 24 in Fairfax, Virginia -- ended up dead with their feet and waists tied together on a riverbank in New York's Upper West Side. It's unclear what mode of transportation the sisters used and the specific time frames they visited each city, a New York police spokesman said. Detectives are combing Midtown Manhattan for surveillance footage and witness accounts to piece together their whereabouts. And it wasn't the first time the sisters vanished. In December, they were reported missing for one day, Fairfax County police said. Officer Tara Gerhard, a spokeswoman for the Fairfax department, said the sisters were "referred to services," but she could not specify what type of services, nor offer additional details, citing privacy laws. The sisters are both Saudi citizens, and their nation's royal consulate general has been in contact with their family and has appointed a lawyer for the investigation. So far, investigators have not found anything to indicate they were victims of foul play, according to a law enforcement official who spoke to CNN on condition of anonymity. Water was found in the sisters' lungs, the official said, which means they were likely alive when they entered the river. Police previously said their bodies showed no signs of trauma. While investigators believe their deaths are suicides, the official said, they are investigating the circumstances surrounding them. The New York Police Department is not ready to determine the official causes of death. Authorities are investigating whether the deaths were the result of suicide, homicide or an accident, said Phil Walzak, deputy commissioner for public information for the New York police. Did the sisters apply for asylum? Saudi officials are looking into whether the sisters applied for asylum in the United States, a Saudi official told CNN. Officials from the Department of Homeland Security declined to comment and referred questions to the New York police. Earlier this week, The New York Times reported the Saudi Embassy in Washington had called Rotana and Tala's mother to inform her that her daughters had applied for asylum in the United States. New York police Chief of Detectives Dermot Shea said Wednesday that detectives have been in Virginia conducting interviews with members of the immediate family to shed light on "what was going on in the two young ladies' lives." "We've made significant progress in piecing together pieces of this puzzle to find out what happened," he said.